Surgery was a dangerous prospect for a patient in the early 19th century. Anaesthetics were not discovered until 1842 so patients endured excruciating pain, with nothing but large amounts of alcohol to help them through. During amputations patients had to be held down while the surgeons worked as quickly as they could. There was little understanding of disease or infection and many patients would survive the pain and loss of blood caused by the operation itself, only to die from blood poisoning later. 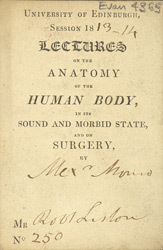 Eminent scientists, eager to inform the public of important developments in medicine often gave lectures such as this one at the University of Edinburgh.